Fartlek. A word that possibly causes the most sniggering when reading, writing or talking about running. It’s just one of those words that makes even sober adults fall apart. Everyone into running knows that it comes from the Swedish word meaning ‘speed-play’ which effectively describes what happens in fartlek sessions. Today’s session consisted of six reps of 400m speed intervals and 200m walk breaks. It was a repeat of the same session I tried this time last week and, as per last week, I had decided to do it on the trails with Murphy. It makes it a harder session running through the woods, but ultimately more rewarding running in nature than on a track or on the treadmill! 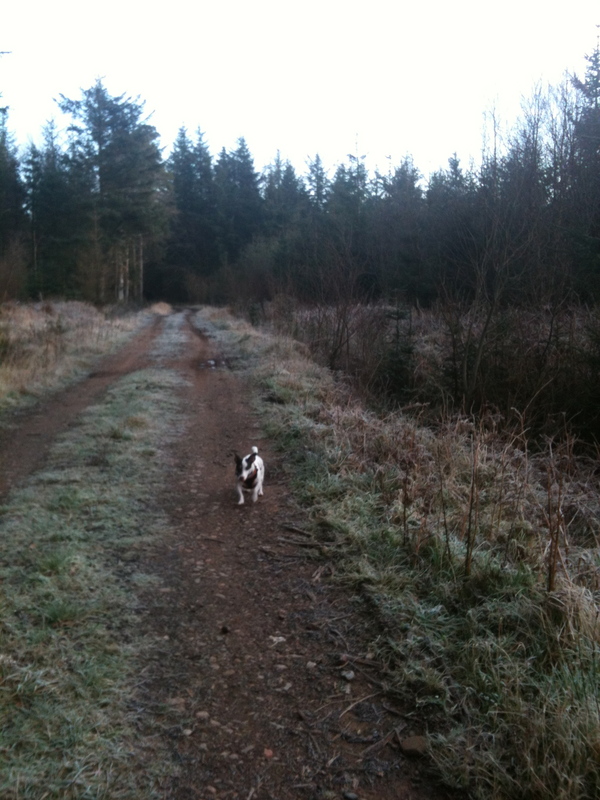 Having Murphy’s company always makes my running more pleasurable – seeing his little legs skipping along warms my heart! The weather was perfect; clear sunny skies, but very cold. It has been raining quite a bit lately but the track was surprisingly dry. Just a few puddles which were easily avoided. The first two speed intervals were hard going. I always struggle with my breath at the start of any run and have to focus on not panicking as my chest starts to tighten up. I know now that it just takes a few seconds to work through the discomfort and then I’m away, breathing normally. It can be quite a scary feeling though. The third and fourth intervals were easier going and largely downhill, giving me chance to enjoy the pace and the view. As we turned the corner to the farthest point on the run we saw two deer grazing. They immediately ran off with Murphy hard on their heels, but not fast enough to catch them thank goodness. Although quite what a small Jack Russell would do with a deer if he did catch one, I don’t know! Heading back is always harder, mostly because it’s uphill. However, I was still benefitting from the third and fourth sectors and their momentum seemed to carry me through the last two sectors. Even though the first two were downhill the last two were far easier! We finished our 2.8 miles in 30:50, not that the distance or time really matter on fartlek sessions. I felt good having coped far better this week than last week. And I have proof of my speediness in terms of mud splats! Feast your eyes on these! I can tell from here how impressed you are! My next run is a 12 km so it will have to wait now until my next day off which is Wednesday. 12k on a treadmill is not my idea of fun! Fingers crossed for some sunshine! 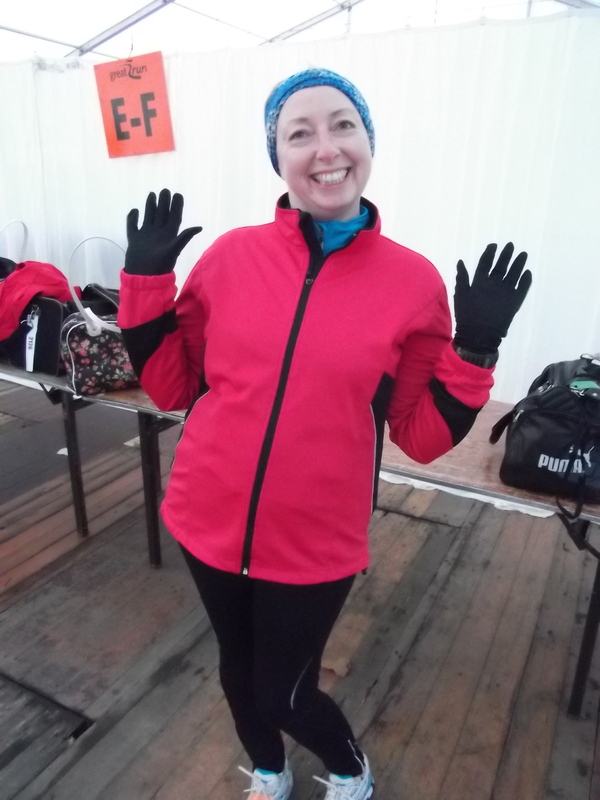 Week 2 – Improve your 10k time! After a disappointing long run on Wednesday I was a bit unsure how tonight’s run would go. My 6 last miles were a struggle; I just couldn’t catch my breath for the first couple of miles and then I had legs of lead. A friend mentioned gluten, just in passing, and it clicked. I’d tried something new the night before and no, I couldn’t stomach it! My friend described it as “kryptonite” and she’s right, that is just how it feels! In the big scheme of things the run wasn’t that bad. I did a steady 5.78 miles in 62 mins. Tonight I hooked up to Jeff’s app. I was down to do an interval run with race pace splits, 6.1 km in all. It was going to be a treadmill run; it’s dark here by 5pm and I wasn’t home until half 5…. I started with a warm up walk for 3 minutes, then Jeff told me to do a steady run at 10.3 kph. This he cranked up to 12.2 for three intervals with 4.8 kph walks after 4 minutes. The first one was hard. It came hot on the heels of a slower run and there was no let up until the 4 minutes were over. The second and third intervals were easier; not easy, but easier. 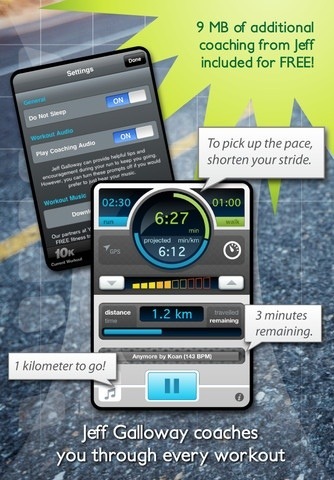 I finished the run in 35:28, hitting 5k in 30 minutes, 5.88 km in all. I’m pleased that the hard pace is getting easier. It’s what I needed, even if I’m initially finding it hard. I know from experience that it will inevitably help increase my pace so I’m happy to give it a go. I don’t find it easy; there are times when I’m mid race pace interval that I could happily switch the treadmill off and get into a nice bubbly bath with candles and enjoy the bliss, but then I’d always be a 65 minute 10k-er and that just won’t do! 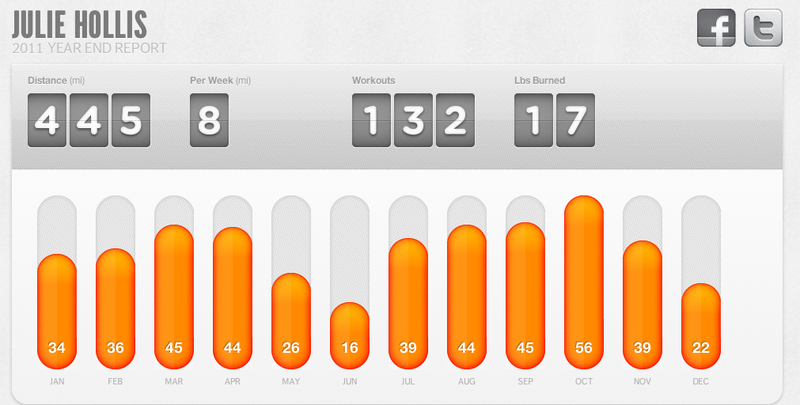 Courtesy of Daily Mile, these are my statistics for 2011! So here I am. Sitting down finally after a long supposed day off! I have far too many commitments that take me away from the things I love to do, running included. However today I decided to start with the thing I wanted to do most, which was to run. I should have completed this run in the week as it was just a short interval session of 3 km. Maybe I should have done it on the treadmill, but I was desperate to run outside in the sunshine, instead of inside when it’s dark! 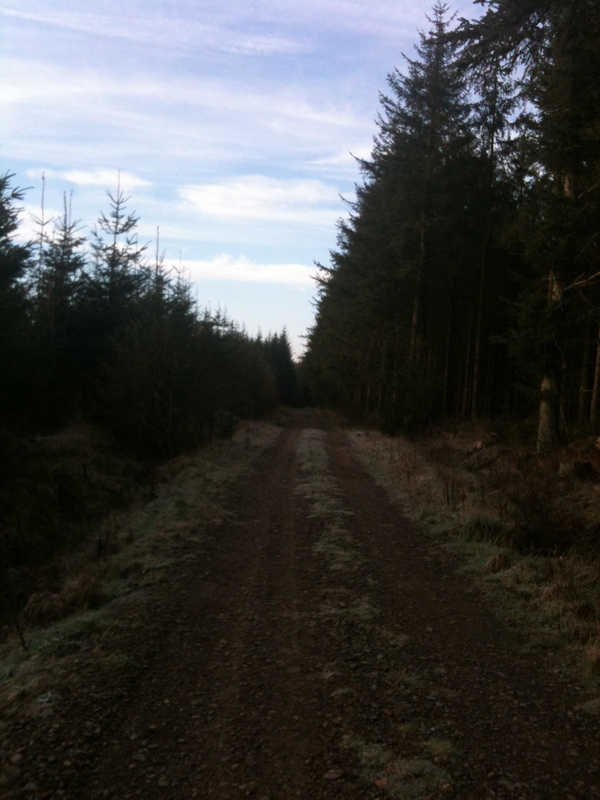 Winter is such a difficult season for running when you live out in the sticks. It’s invariably dark when I get home and my choices are immediately limited; it’s either run in the town (a twenty mile round trip) or run on the treadmill. I don’t mind running on the treadmill or in the town, but nothing is better than running through the countryside on a clear, frosty day! I decided that my dog should come too because he loves running with me. He is one of the best behaved dogs I’ve had, completely happy to be a companion and run at my heels. He’s good company for me too. Running can be a lonely occupation and I’m not good at running in a group. We headed into the woods that lie between our houses and the shore. It’s a lovely piece of managed woodland which the owners are happy for walkers (and runners) to use when they aren’t working the timber. When they are there are usually plenty of warnings and alternatives routes you can use. During the summer they cleared a huge part of the woodland, making a mess of the tracks at the time, but then regrading them later on. This has made the tracks far better for me to run on. Although I had the iPhone attached to my arm with Jeff Galloway’s app running I also had the Garmin running, just as a back up and also because I’ve had battery issues recently and I need to know that it is working properly now. 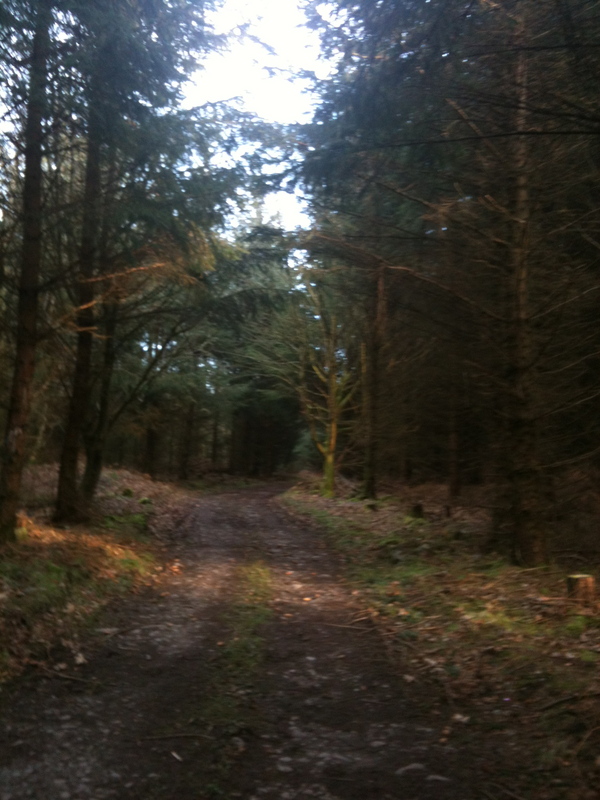 Basically my run was to consist of a 2 minute warm up walk (I did about 4, just getting to the start of the forest!) followed by a 5 minute easy run and then 4 x 400m runs at faster than race pace separated by 200m walks. 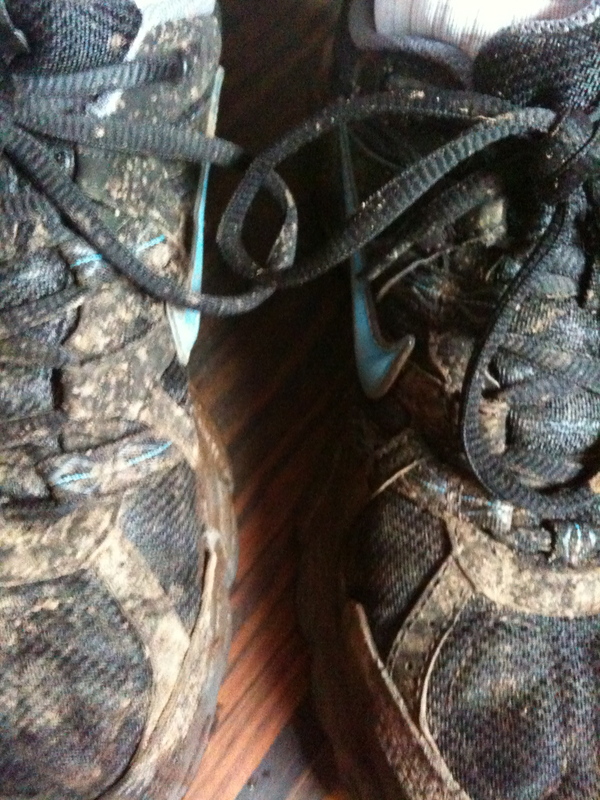 Jeff advised me to head for the running track; I headed for the muddy track! 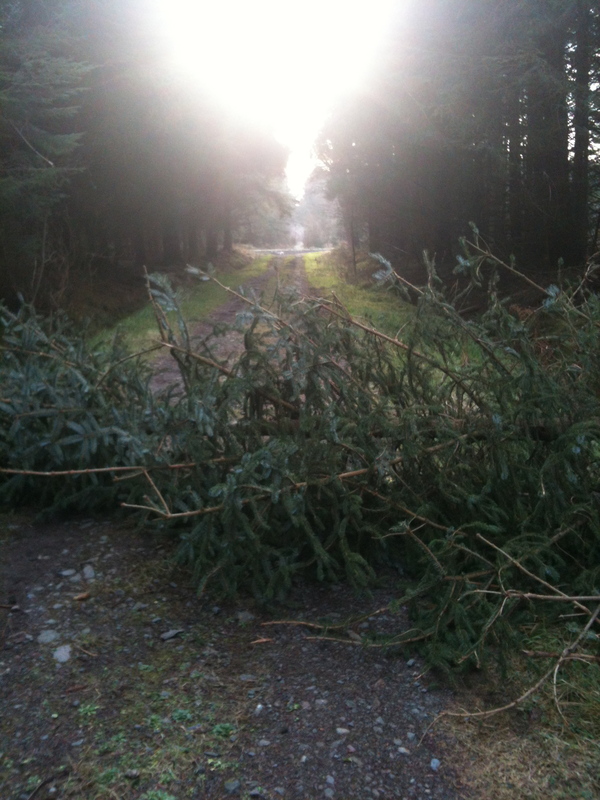 The recent strong winds had brought down this fir tree, blocking the path. Luckily it hadn’t quite reached the dyke at the side of the road and I was able to pick my way round. I was surprised. I thought I was going to be struggling doing the faster sections, but they were almost comfortable. At the moment I know I couldn’t maintain that pace for an entire race, but I’m only on day two! I ran downhill for the first two speedier sections and uphill for the last two. Undoubtedly I would have been faster and less tired on a track, but what I got today was a good all over workout, which is what I needed. I haven’t been feeling quite “right” lately and maybe it’s a bit of seasonal adjustment disorder. In any case being outside in the sunshine, no matter how cold it was, was exactly what I needed and I felt set up for the day. I finished my run about a third of a kilometre from the road, but it didn’t matter. I just walked and took some photos on my phone to show my friends what my running route was like. Next run is a 10k which I won’t get a chance to do outside until Wednesday. The forecast isn’t great, but I’m looking forward to dedicating an hour or so to that on my day off. Improving my 10k time, eventually. After a few days of wrestling with twelve A4 sheets of paper, each one for a separate month, I reached the conclusion that I should totally focus my efforts on the Great North Run in September, not try to kill myself by running another half in the spring, but instead concentrate on improving my shorter race times and do a few shorter races. Bingo! That’s me sorted for the year then! I decided, for no obvious reason, to start by improving my 10k time. At the moment my race PB is 65 minutes and I’d really like to get under the hour, at least. So, once again, I’ve turned to Jeff Galloway for guidance. I know that everyone has their own running gurus, but Jeff was my saviour when running all of a sudden became incredibly painful and every run was soul destroying. His run:walk:run system has been well proven by even long standing runners to work, allowing them to run as fast in the closing stages as in the starting ones by allowing muscles to rest before they become tired. My own interval times are invariably constant, if not faster towards the end. 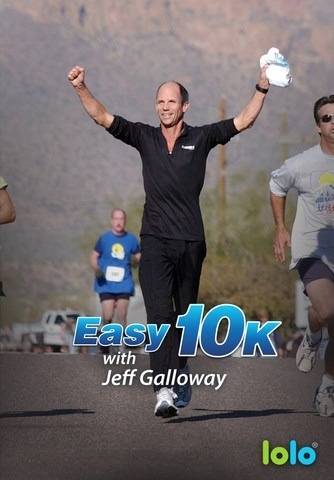 I have started using Jeff’s Easy 10k app, with it set to improve my 10k time. I’ve set the goal and he’s worked out a training programme with an appropriate walk interval length and pace. 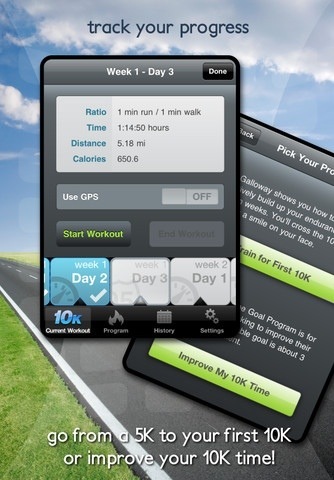 It works exactly the same as the 5k programme of his that I used to hit my 30 minute 5k target last summer. 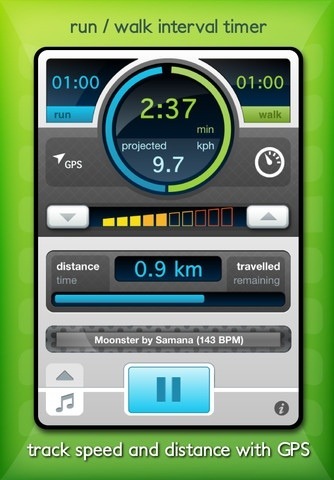 The app, designed by LoLo, uses beat synced music, either theirs which you can download for free or your own for which they work out the bpm. It’s pretty impressive and their own music has grown on me as I’ve used it! My first session was a 6.5km run. It started nice and easy with a 4.8 kph walk and then I did two run intervals of 10.3 separated by a one minute walk. It sped up slightly after that to 11.3; not a problem. Then Jeff said let’s do it at race pace. Holy moly, I wasn’t expecting that! 12.2 kph for hours! Well it seemed that way! I just about managed it and, to be fair, the more I did, the easier it got. This was followed by a five minute run at 11.3 and then a three minute walk. Let’s say I knew I’d done it! I’m also trying to build up my core. Nice and easy to begin with because last time I ended up hurting my shoulders and neck. I’m focusing on planking to improve my general core strength and leg raised crunches to improve my lower abs, my weak spot. Once I can see that I’m getting somewhere with those I can start of my obliques and upper abs. There is method in my madness. So, that’s that then. I’m sitting in the hotel bar, using their free wifi and drinking hot chocolate in an effort to warm up a bit! And I’m even sitting here wearing my race t-shirt, but even I’ve stopped short of wearing my medal! It was very cold today. Very, very cold. Apart from when we were very warm. That would be “The Race”. I was clock watching from about half four this morning, not wanting to miss an early breakfast. We left the hotel earlier than we’d planned as we were ready and I was getting nervous sitting about. I worry only about the logistics of getting to an event; I’m never nervous once I’m there, I just get anxious that something will stop me from getting there in plenty of time. But, of course, we’d researched the buses and their routes and timetables and we knew that there was a bus that stopped outside of the hotel and would take us to Holyrood within 20 minutes. We arrived at Holyrood Palace at around half 9, hours early, but we were there safely! OCD, me? Although we both had three layers on the air was cool and the wind was savage. We were both frozen through within a few minutes. Our only option was to keep on the move. We must have walked a few miles before the start just trying to stay warm! We watched a bit of the cross country and at about 10:45 we went across to the baggage area to leave my bag. The warm up was hilarious; there were nearly 2000 of us lined up, all trying to see what the instructor was doing (most of us in vain) and then attempting to copy him, packed in as we were! I almost took someone’s eye out with my water bottle and decided then to stop! We started a full 7 minutes after the elite runners who, by then, were almost half way round! As we crossed the line together, of course, I called to Grant to go easy. It’s so easy to get carried away from your pace in the first few metres. Neither of us were quite prepared for the climb. The road up was a 1:10, meaning that for every 10 metres we ran we climbed another metre. It basic terms it was bloody steep and we were soon overtaking those who had already started walking. Unfortunately we’d decided to start at the back and so we had a lot of folk who were slower than us in front of us. It was really tough getting past them as there were so many of them! We reached the top, so we thought, after 2 km and the path widened out. The views were spectacular. It was clear and bright and you could see for miles around. At least I could; Grant had no interest in the view, he just wanted the hills to stop. One last incline and we were starting on the downward run for home. At this point I felt tethered; as much as I wanted to run with Grant I knew I could just fly off. This was not an easy course. ‘Challenging’ is the way they describe it but I was really enjoying it! The sight of Edinburgh Castle as we rounded Arthur’s Seat was so inspiring. The finish was down there somewhere! We had been run:walking the route on a 4:1 ratio, but as we hit the downhill Grant decided that he didn’t need to walk; he could see the 4 km banner and the finish was only a kilometre after it! I pushed him on, knowing that we could break the 36 minute target I’d set us. As we reached the flat I could see that it was hurting Grant. I was worried that he wouldn’t actually make it and, by the colour of his face, I wondered if he’d actually be taken home in an ambulance! I took his hand and we ran the last few metres to the finish. As we crossed the line I raised our arms and cheered. We’d finished in a time of 35:52, absolutely brilliant for Grant’s first 5k. Once we’d collected our goody bags and retrieved my gym bag we just headed back to the hotel a little more elated than we’d left it! 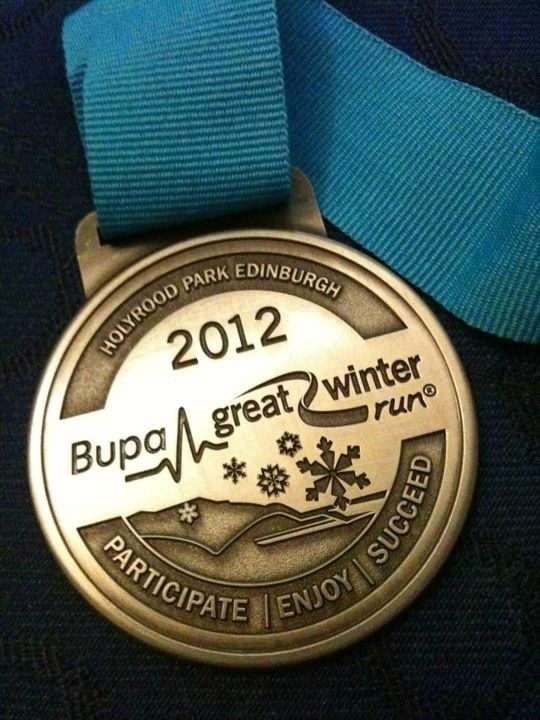 Our medals are simply awesome! We’ve already decided that, even knowing now exactly how steep that starting hill is, we will be back next year. 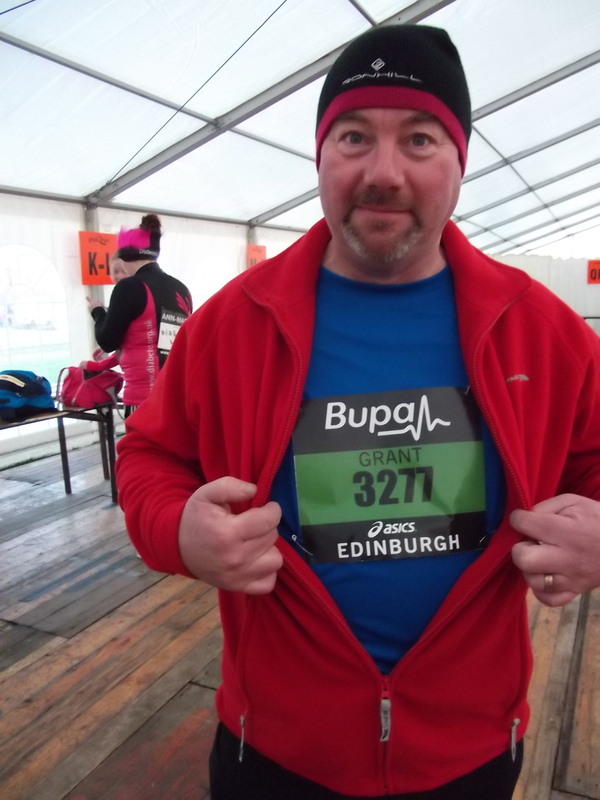 It’s the day before the Great Winter Run and I’m currently updating this blog on my iPad whilst Hubbie drives us the 70 miles up to Edinburgh. Dedicated is not the word. The gallery reopened this week and although it hasn’t been busy in terms of customers, I have been busy sorting out displays and framing, leaving me with not very much time for running. In fact I don’t think I’ve run at all this week apart from last night. Our last run outside was on New Year’s Day. Since then we’ve been battered by storm after storm but I felt less guilty as runners tweeted that they were also giving up hope of running outside. I did a speed session on the treadmill, my favourite 20 minute double pyramid, which is needing a tweak – it’s getting too easy! Last night I had two thoughts. I would either run an easy 5 miler or do a fast 5k. Until I actually got into the “gym” I still wasn’t sure which I would do. In fact whilst I was warming up I still didn’t know! I started the treadmill at 9kph. It felt slow and at that moment I made my choice; I needed to run! I’ve done so many slow runs lately, training for my half marathon and latterly training Grant, that I just haven’t done a decent 5k pace in ages. I wasn’t sure what I could do, but I was up for a challenge! I knew that an 11.3 kph speed would give me a sub 30 minute run, but I didn’t feel confident just launching myself into a faster pace so I started at 10 kph and gradually sped up. I ran 4 minutes with 1 minute recovery, not because I can’t run for 30 minutes straight, because I know that I can easily do that, but because I hadn’t run at this pace for a while and I wanted to save something for Saturday’s race. I felt strong and by the last km I was running at 12 kph and it looked as if I would indeed do a sub 30 minute 5k. This was great; I hadn’t done this in ages and I was still capable of pulling it off. With a bit of speed training, what am I really capable of? I missed my 5k time, somehow not managing to hit the pause button several times, but clocked 5.07 km in 29:54 giving me 9:29 per mile pace. By that calculation I should be doing 3.01 miles in around 29 minutes. Not bad for a long distance runner! Our running bags are packed. I hope that I’ve remembered everything for us both! I’ll unpack later and check it all. Our biggest worry, apart from the hill we’ll be climbing for the first half of the race, is getting to the venue tomorrow morning. I’ve found a bus that picks up outside of our hotel and, hopefully, drops us off at the end of Holyrood Road, not far from the start. We may or may not have time to check this out this afternoon. We’d both feel better if we can! What country mice we are! We won’t be ‘”racing” tomorrow. Our objective is simply to finish. Finishing holding my husband’s hand will be prize enough! If we finish in around 36 minutes we’ll be happy. And I shall be celebrating, with many rums!